A couple of months ago a friend of me come to me with an interesting problem. He has some old lamps that run on 12V and use small halogen lamps. The problem with these lamps is that they're fragile and are getting more and more rare to get. This also makes that these lamps get more and more expensive. The idea is to make a LED replacement that fits in the existing housing. I wanted to get enough light to have descent illumination. About 200 lumen should be good. I ended up choosing the Osram Golden Dragon + LED LW W5AM-KXLX-5K8L. I first used a 5600K white LED which can handle up to 1A of current and gives 100 lm at 350 mA. I used two of those running them at about 350 mA giving about 200 lm. Running them at 350 mA means that the LED runs relatively cold and nicely within specification. Accidentally it is also the place where the lumen per mA curve has it's peak. After testing the the 5600K white LEDs we decided that a warmer color temperature would be nicer. The 3500K warm white Osram LCWW5AM-JXKX-4O9Q still gives a nice 82 lm at 350 mA. They cost about 2.5€ a piece. Chosing a LED driver is not easy mostly because there is so much choice. After I started working with them I noticed this chip as a very nice surprise feature. It contains an internal 4.5 voltage regulator. The specifications say you're not supposed to use it but I figured drawing ~ 100 uA from it shouldn't be that bad. This means I can add a small dimming circuit that drives the PWM pin of the driver IC and have nice dimming. It is a quite simple buck driver. The diodes are actually fast skottky diodes. 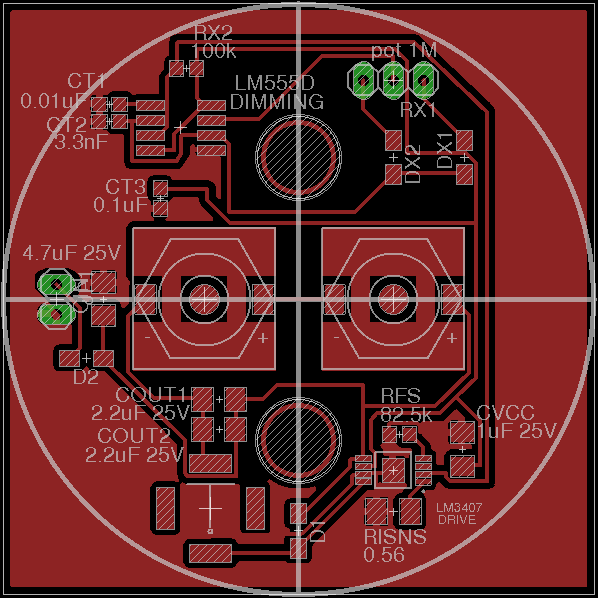 The 0.56Ω current sense resistor programs the driver for 350 mA. The 82.5kΩ resistor programs the buck switching frequency at 525 kHz. The DIM and VCC pins are connected to the dimming circuit. The dimming is done by means of a 1M linear potentiometer. 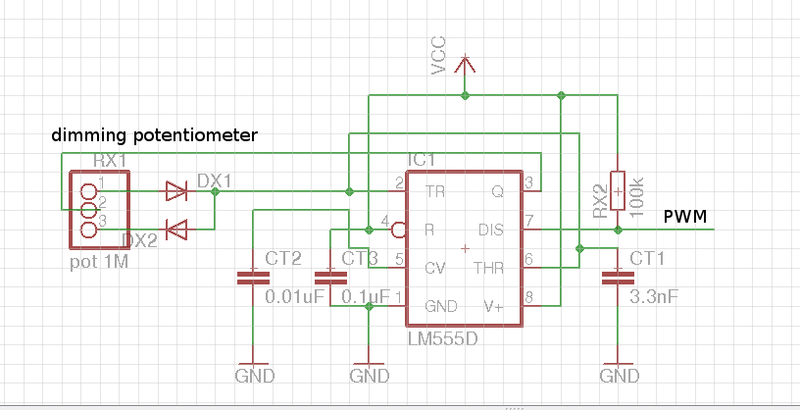 A simple CMOS 555 based circuit converts the potentiometer setting into a PWM dimming signal. I choose the 555 components to have a 500 Hz PWM frequency and a minimal current usage. One odd thing about the specific 555 I'm using (ST TS555IDT) is that it doesn't have a dot that indicates pin one. One side of the IC is slightly curved which is the only orientation hint. In order to have the circuit use really no power when it is off I use a potentiometer with a build-in switch, like used to be done with radios where you turn then off by completely turning down the volume. There are some oddness there mostly due to being a single sided design but it works fine. It turned out pretty good. It is also very nice that it uses very little (only a few miliwatt) of power when the LED is minimally dimmed and it still gives a nice dimmed illumination. I think the knob is a little big, I should look into a smaller solution for that. Hi. Which circuit simulation software did you use I cannot find the LM3407 in anything I've tried. I did not use any circuit simulation software. I just made it directly using the datasheet as a guideline.